This is a guest post by Nabeel Hyatt, Founder and CEO of Conduit Labs, which is the creator of Loudcrowd and other social games that help you experience music with your friends. 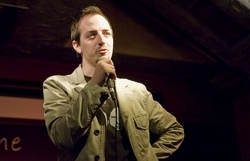 His personal blog can be found at nabeelhyatt.com and he can be followed on Twitter @nabeel. Yesterday, Facebook announced they are going to drastically alter the way applications can message users once again, likely throwing a wrench into every app developers’ growth rate. Hints of the coming turmoil appeared last week when Facebook changed the way feeds work. This caused enough worry that apparently Mark Pincus, Founder/CEO of Zynga, canceled his appearance at Harvard Business School so he could sit with his team and figure out what the impact would be to the viral rates of their massive hits such as Farmville and Cafe World. That’s not surprising, since getting posts in the feed is critical to continued growth, but the myopic focus on the “viral rate” by some in the industry has created an over-dependence on perhaps the wrong number. In all the talks about virality the general focus is on the new, clever, and sometimes underhanded ways to increase your viral rate. What gets lost is the core message that, as Siqi Chen of Serious Business puts it, viral messaging tactics are just a force multiplier on the inherent viralness of your product. Or, in simpler terms, how good your product is in the eyes of your users actually is the most important thing. Viral messaging is just a way of greasing the skids on that user’s intent. It is an important later step, but not the root. And how do we measure that intent? 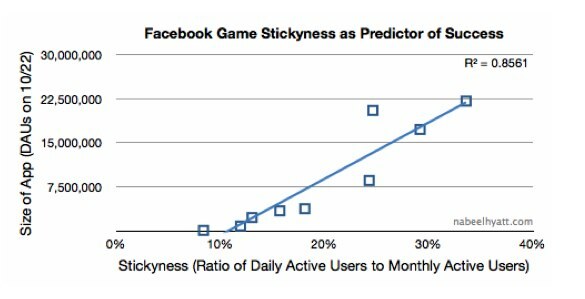 It turns out that in Facebook at least, the level of retention is the best public number to predict likelihood of a hit. Real retention numbers for other people’s products are notoriously hard to come by, but in Facebook there is good 30 day retention data called the DAU/MAU Ratio – which can also be called Stickiness. This is the ratio of Daily Active Users to Monthly Active Users. For example, a DAU/MAU ratio of 50% would mean that the average user of your app is using it 15 out of 30 days that month. It turns out this simple metric is enough to predict, with a high level of probability, the success of a product. For example, look at the correlation between the following set of Facebook games. Here we have games that fit a broad set of criteria, in terms of brand association, demographic appeal, play style, and time since launch. See how the second column and the fourth column are almost perfectly in order? Despite this broad cross-section of games it appears there is a very direct correlation between stickiness and success. Let’s take a deeper view of the data. For those who aren’t stat geeks, this is called the coefficient of determination (R2) and predicts whether two correlated data sets accurately predict future success. If everything lined up perfectly on the linear regression line above you would have an R2 value of 1, and then we could say there is a perfect correlation between Stickiness (x axis) and the Size of the app (y axis). Using these social games we have a rather astonishing “fit” of 0.77. Stepping back, this data is quite remarkable actually, since you would expect Stickiness to go down as you get huge. It would stand to reason that your 20 millionth user, who might be experiencing their first Facebook game, is going to be harder to retain than your 1,000th. The fact that this is not happening yet, that no one has found the edge of users where suddenly retention metrics collapse, says something very powerful indeed about the potential size of the social gaming market. But it isn’t the market size implications that are the big takeaway, the relationship between Stickiness and success is. This of course will also cause a messaging arms race around retention, and the prevalence of Free Gifts is a good example of that already happening. But just as with the viral rate it’s important to remember those are all simply tactics to enhance a products inherent retention. The clear inference is that building something users love to come back to is the best predictor of success.